Our 1983 Marine Trader has a Manual Anchor system. I am currently researching options for Windlass. It will have to be mounted on the pulpit. I ask the forum for some points of wisdom on install and products? This is how I did mine. 316 stainless box with the motor for the capstan inside, it keeps things dry and increases the fall into the locker below. I brought everything up to the rail height so the vertical windlass loaded at 90 degrees to the chainwheel. The back is closed with UHMW plastic, so if you want to fit a power point for lights or anything else 12V you can easily fit it. My LED flood/spot power point is there, with a switched solenoid. Original plan was to add a water wash down point there as well, but routing the water line to the bow was problematic. I do not see a chain stopper , how do you anchor when chain is required? The vertical drum is superb for docking and rafting as well as kedging off. There is only 50' of chain spliced directly onto the nylon, so I never have less than 50' out when I anchor. An all chain rode would make a 30' vessel too bow heavy, even the windlass and 50' of chain require counter weighting in the stern to make my shower drain correctly. Splendid arrangement or should I say design. It’s compact and very nice looking. Something mine completely lacks. How does the stacking of the rode go? Do you often need to go below and knock the stack down? Many complain about that what I suspect to be a more chain more chain problem. Do you use Brait or three strand? Do you tie off to the sampson post for bow mooring lines? All good questions :-) With 50' of 3/8" chain and 600' of 5/8" nylon in the locker, the stack issue depends on how much I let out to anchor. If I drop most of it, then I have to knock the stack over. If I only drop 150-200' then it stacks itself just fine. I put a quick release access port in the anchor locker door inside, so I can quickly pop it open and knock down the stack. Once in a while the chain settles into the rode in rough water transiting across the Gulf and I wind up having to free the chain to drop anchor when it tangles in the nylon. Next time I buy anchor line, it will be brait, for now it's three strand. No odors in the cabin, no water in the anchor locker, no drain in the anchor locker either. I use the Sampson post for both dock lines and the anchor line when mooring. 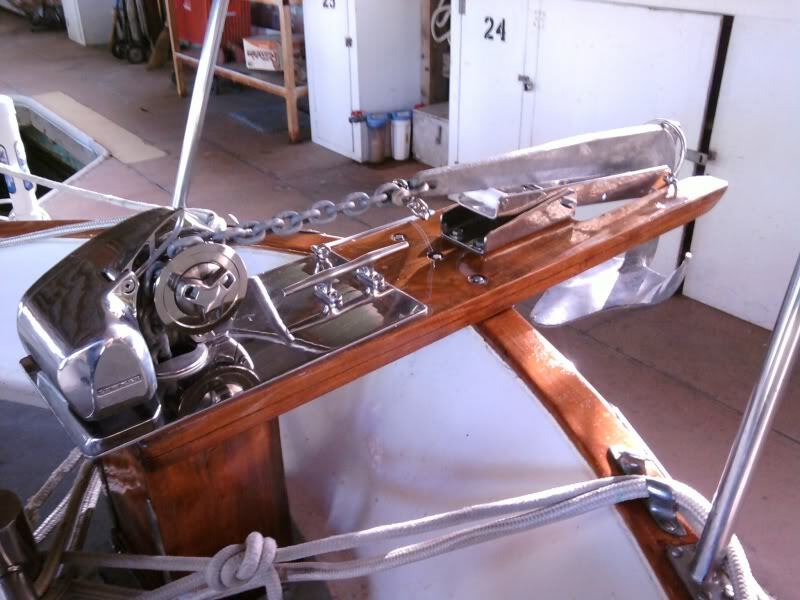 I did move the bow roller out on the deck to accommodate the Rocna and move the tip away from the hull, I would like to go up one size Rocna in the future but have never had issues with the 15K on the bow. I installed the Lewmar Pro Series 1000 on my Californian 34 LRC. I works beautifully with a 33 Lb Lewmar Claw, 120 ft chain and 240 ft of Brait. I have a hard wired control at the lower helm plus a wireless remote for use elsewhere on the boat or dock, as needed. Here's a post about my anchor locker mod with plastic tiles to help prevent rode stacking. Don't have a locker drain and never has any smells. The photos in the link below show how little debris I had in the locker when I cleaned it after 10 years of ownership and frequent anchoring in the SF Bay and CA Delta. The vertical windlass occasionally has the nylon rode run under the stripper instead of making it's 90 degree turn down the hole, which jams the line in the stripper and usually requires dismantling the stripper. I had a remote control for the windlass, but chose to not install it because of that issue. Instead I tend it where I can watch for a knuckle trying to jam in the stripper.